Author, What Are You Doing Here? 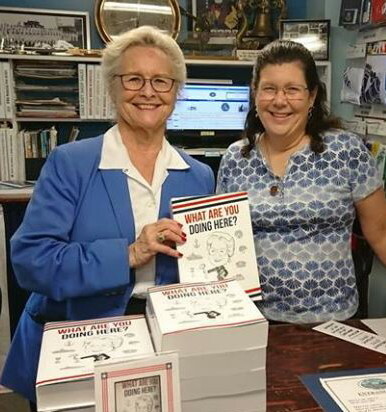 The book is for sale at the St. Marys Submarine Museum. Shown in the photo is Sheila and Museum's weekend employee, Lisa Bell. Sheila M. McNeill was the National President of the Navy League of the United States from 2003 - 2005. The Navy League is the only civilian organization dedicated to supporting the sea services - the U.S. Navy, U.S. Marine Corps, U.S. Coast Guard and U.S. Flag Merchant Marine. As National President, McNeill was responsible for leading the Navy League's 70,000 members who are dedicated to educating American citizens and elected officials about the importance of sea power. The Georgia native is the first woman to hold this position since the league was founded in 1902. She has been a member of the league since 1966 and served at every leadership level and now serves on the national advisory board and Chairman of the Legislative Affairs Advisory Board. McNeill served as a national vice president responsible for the organization's legislative affiars activities. While serving in that position, the aggressively sought support on Capitol Hill and made educating congressional members about the sea services her rop priority. She also serves as the National Chairman of the Navy League's "America's Strength" campaign. She is a region leader for the Submairne Industrial Base Conference and on the Board of Directors for the Dolphin Scholarship Foundation. Because of McNeill's long history of active involvement with the sea services; she served as vice chairman of the executive committee for the Defense Advisory Committee on Women in the Services (DACOWITS), an influential advisory committee to the secretary of defense and other DOD and DOT officials. During her three-year DACOWITS tour, McNeill visited 45 U.S. Military installations throughout the world. In her home state of Georgia, McNeill serves as President of the Camden Partnership. She is a member of the Executive Board of the Governor's statewide Military Affairs Coordinating Committee and Board of Directors for the National Strategic Deterrent Coalition. McNeill was commissioning president of the St. Mary's Submarine Museum and Charter Chairman of the Military Community Council. She continues to serve in both organizations. She was co-chairman of the USS Bancroft Sail Exhibit at Kings Bay Submarine Base to celebrate the 100th anniversary of the Submarine Force. She has been on the Board of Directors of the Chambers of Commerce in Glynn and Camden Counties. McNeill was named one of the 100 Most Influential Georgians in Georgia Trend Magazine. She is the sponsor of the USCGC SEA HORSE (SPB 87361) and served as Chairman of the USS GEORGIA (SSGN 729) Return to Service Committee. She is Chairman of the USNS Brunswick Committee. For 18 years, a Fortune 500 company employed McNeill where she was responsible for industrial relations and labor negotiations. McNeill has received numerous awards including the Secretary of the Navy's Distinguished, Superior and Meritorious Public Service medals; the United States Coast Guard's Distinguished and Meritorious Pubic Service medals, the 2004 U.S. Armed Forces Spirit of Hope Award, the International Federation of Maritime Associations Service Medal, and was the first female recipient of the Spanish Navy League's highest honor, the Golden Anchor Award. She is the recipient of various community service awards. The Georgia Chapter of the National Defense Industry Association (NDIA) selected McNeill for their Citizen Soldier Award. McNeill is married to Arlie McNeill, a Navy veteran and long-time Navy League member and national director emeritus. They have one daughter, Leslie, and four grandchildren, Ryan, Norah, Rayne and Kylie. These stories include many people - military, community stewarts, volunteers, and politicians. 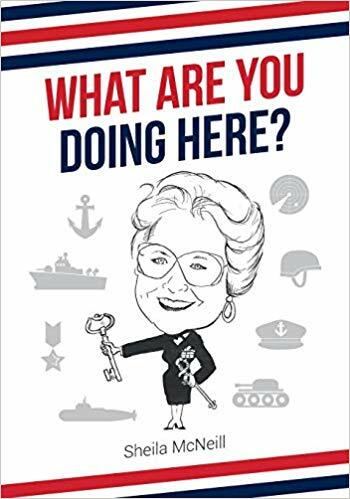 This one question has swirled around Sheila McNeill since her involvement with the Navy League began 50 years ago. Sometimes it was overheard from nearby conversations when she walked into a room filled with mostly active duty or retired military personnel. Other times, those questioning why a woman with no prior military experience was in the same room. They took a more direct, sometimes confrontational approach when they asked McNeill "What are you doing here?" The book "What Are You Doing Here?" can be purchased from the St. Marys Submarine Museum.